We support families to raise funds for lots of things including specialist therapy and treatment that wouldn’t otherwise be available to them. This includes operations like SDR (Selective Dorsal Rhizotomy), cancer treatments, and various forms of therapy that will enable children to have a better quality of life. Hydrotherapy, physiotherapy, speech and language therapy and cognitive therapy are all types of therapy that we often fund for children to help improve their medical condition and quality of life. However, these are not limited and Tree of Hope will help children get the specific therapy they need. Physiotherapists support people affected by injury, illness or disability through movement and exercise. They aim to maintain the health of children and adults by, helping patients to manage pain, prevent disease and facilitate recovery, enabling them to become more independent. We have lots of partnered suppliers that we work with regularly here but we also work with thousands more to ensure your child is getting the best and most suitable therapy for them. Hydrotherapy is therapy in water often used to relieve discomfort, pain and soothe muscles and joints. Tree of Hope can support families to have hydrotherapy or install hydrotherapy pools at home. Speech and language therapy helps treat, support and care for children (and also adults) who have difficulties with eating, drinking, swallowing and communication. 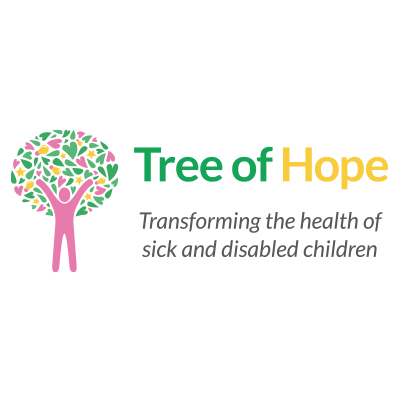 You can apply for support from Tree of Hope initially by filling in this short form. Georgie or Lee in our Family Support Team will then get back to you within three days to talk to you about getting started with your fundraising campaign!